*I’ve had a few requests for a blender version of this juice so I’ve included both options in the recipe section. Both versions are great, it’s just a matter of which texture you prefer and whether or not you have access to a juicer. I’m having a hard time zipping up my jeans. With our move, dealing with a new commute and my sons sports schedule we’ve been eating on the run way too much. My son and husband are super active and can eat whatever they want without any consequences. Me, not so much. I have to admit that it’s hard to be around people eating pizza and cheeseburgers and not want to partake. At my age I just can’t eat like that without putting on weight and it’s getting harder and harder to take those extra pounds off. I remember in my 20’s I could just skip dinner and wake up 5 pounds lighter. These days I feel like I go for weeks eating nothing but kale and green juice without the scale budging even a bit. 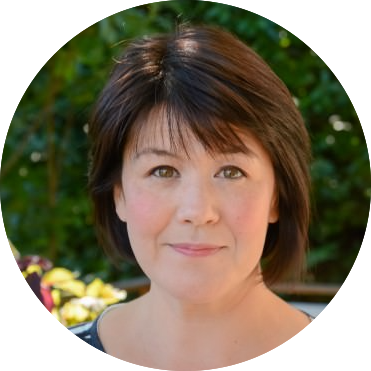 I find when I am looking to clean up my act a bit that juicing really helps me keep my appetite under control and curb sugar cravings. Since I really don’t eat breakfast very often it’s a way for me to stabilize my blood sugar and keep me going until lunch. Fresh pineapple isn’t something that I buy very often since it can’t be grown locally but it is a treat that I indulge myself in once in a while when they are in season. They have such a lovely aroma, it’s quite intoxicating and they immediately bring back memories of vacations spent on tropical beaches. 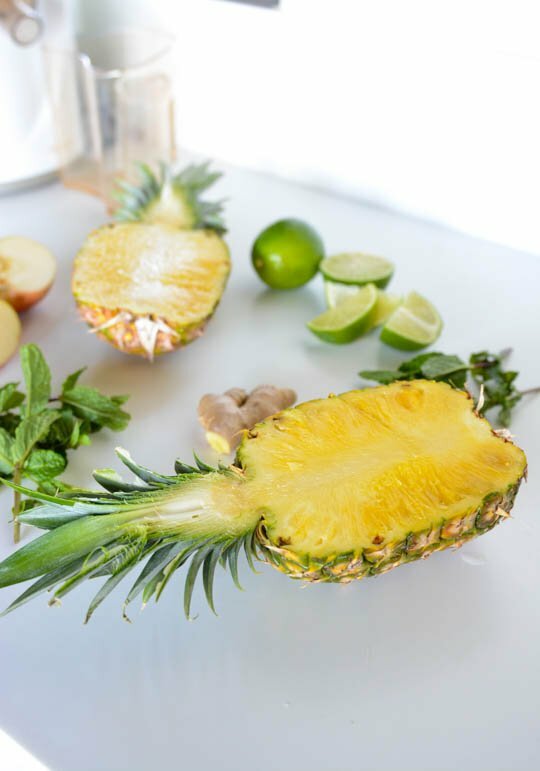 When purchasing a fresh pineapple pick one that is extremely fragrant, and more yellow than green. Also look for the top to be slightly loose, that will indicate that it is ready to go. 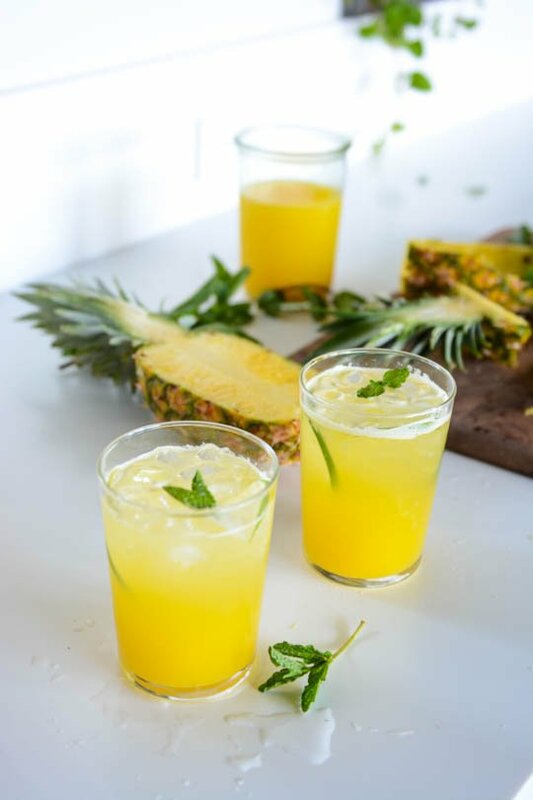 Pineapple is a beneficial for detoxing your body to the presence of bromelian, a powerful digestive enzyme. This enzyme has been proven to aid in digesting protein, breaking down fats, and reducing inflammation. Ginger is also a powerful anti-inflammatory and high in antioxidants. If you don’t have a juicer you could put all the ingredients in a high speed blender instead. I would finely grate the ginger before adding it to the blender so you don’t get all the stringy fibrous pieces in your juice. 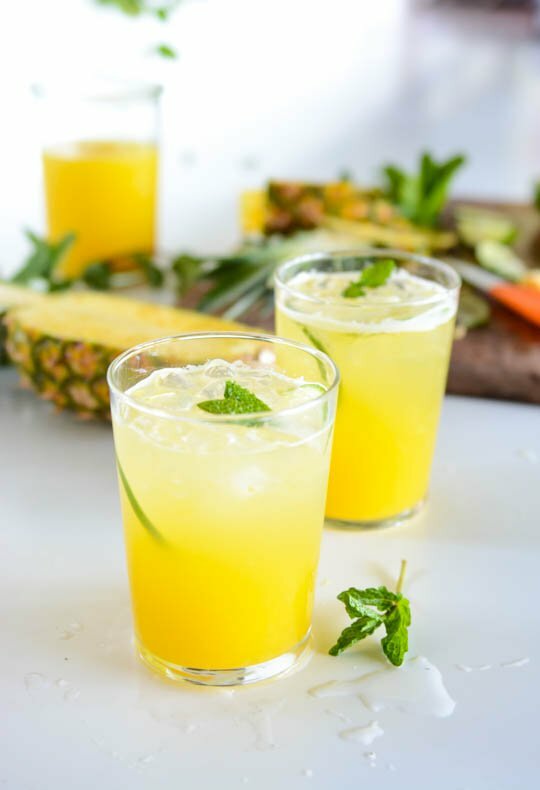 This juice is full of fresh pineapple and ginger. If you don't have access to a juicer you can place all the ingredients in a blender. Strain the mixture through a nut milk bag or cheesecloth if you don't want to drink the pulp. Note: you can juice the mint leaves for more intense flavor but increase the amount to ½ cup. It will change the color of the juice to a pale green however. 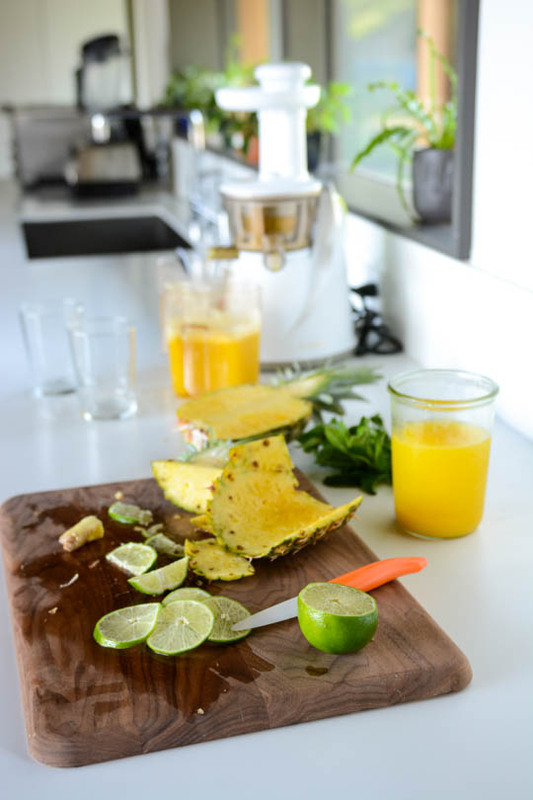 Juice the apple, pineapple, lime and ginger according to your juicers directions. Stir in the coconut water. To serve add the mint leaves to the bottom of a glass and lightly crush with the back of a spoon to release the essential oils. 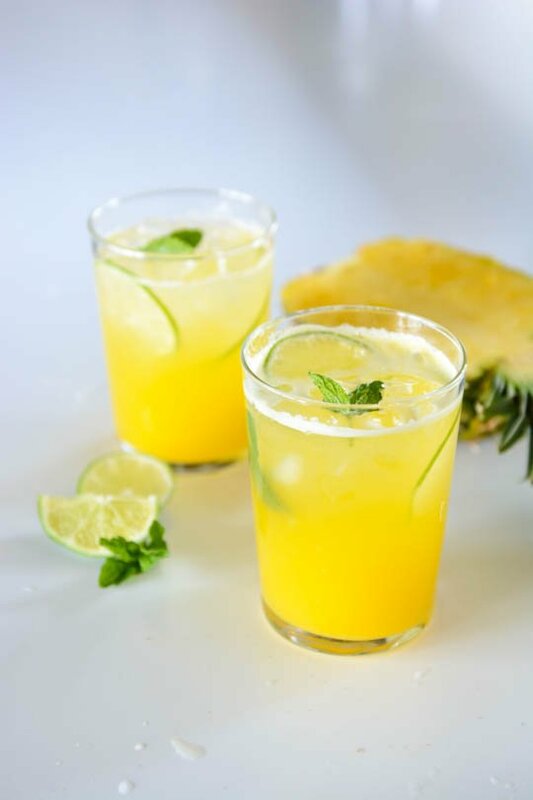 Fill the glass with ice and top with the pineapple coconut water. Garnish with a thin slice of lime. 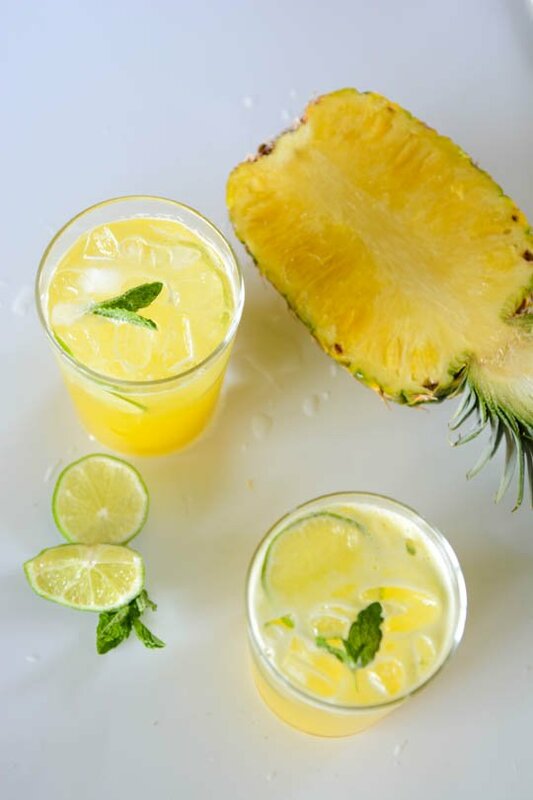 Pour the coconut water into the jar of a high-speed blender and add the apple, pineapple, mint and lime. Using a microplane, finely zest the ginger into the blender. Blend on high until the mixture is smooth. For a finer juice you can strain the mixture through a cheesecloth or nut milk bag. To serve add a few additional mint leaves and a thin slice of lime. I’ve included a blender version in the recipe section of the post. Hope you like it if you try it! To keep the color the same, you might want to just crush the mint leaves in the bottom of your glass. If you add them to the blender it will change the color. Can you post the blender version please? I included an option for a blender version in the recipe section of the post. Hope you like it if you try it! If you use the mint leaves it might result in a different color. If you want it to stay orange, just muddle the leaves in the bottom of the glass and just use a few. We have a wellness day at our property once a month and I am going to try this out with the residents will let you know how it goes. But first I am going to try it on my kids at home, and then the staff. Would love the blender version of the recipe! I’ll need to get a blender, but it looks super yummy! You could use coconut milk but it would completely change the result. It would be more smoothie like, rather than a mocktail. If you choose to try to with coconut milk in the blender there shouldn’t be any need to strain the mixture. I’d love to hear how it turns out if you give it a go!